I flipped my flip when I saw that Close to My Heart had added fabric to the Spring Summer 2013 Idea Book. Woooo Hoooo! Now I can start doing all of the cool fabric projects I’ve been pinning! Last week, during our short lived Snow-quester I got out my Chantilly Textiles, logged on to Pinterest and was drawn to my friend, Shelley Smith from www.houseofsmith.com. Now, this isn’t the first time I’ve been inspired by The House of Smith’s and no, she’s not actually my friend in real life (yet)…but we like each other’s stuff socially (me more than her, but who’s counting). Cut circles from your favorite fabric. I used between 5 & 6 for each row. Start with a roughly 3" circle and then make them smaller for each subsequent circle. Don't worry about making perfect circles - it really won't matter. Also, cut a circle from felt, about 2 1/2" for your base. Next, fold one of your largest circles in half and then fold in ONE corner to the center one way and then the other corner, the opposite direction, the OTHER way. Check out my video to get a better idea of how to fold them. And you don't have to make the fold perfectly even. It looks better if they aren't, actually. 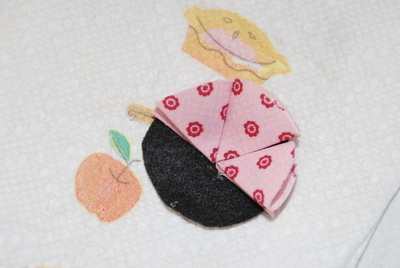 Hot glue the folds together and then glue the folded circle to the felt, basically like assembling pieces of a pie. Complete the first layer with your largest circles and then add a second layer and a third. 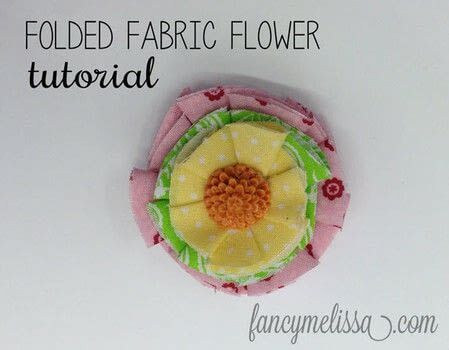 Finally, find a cute button or flower or another fun embellishment to add to the center of the flower to finish it off. Then just add it to your favorite project!